InfoBrowser FREE is a tiny Web Browser and File Viewer. it can be bundled with your own software. It's meant for software developers that need to easily add a Help System or a small Web Browser to their application. - it is FREEWARE even for commercial use! All you need to do really, is put InfoBrowser.exe in your software folder, and state (in command line or INI) the web address or file name you want it to display. The file InfoBrowser.ini can optionally store default settings for InfoBrowser's behavior, URL, position, color and size (similar to those on the command line parameters). You can edit this file directly using a text editor (like Notepad). When a setting is supplied both in command line and INI, the command line setting is used. This file can be deleted if you only use command line. AppTitle = Will be displayed as InfoBrowser's window title. it's FREE even for commercial use! How can I tell it to browse to another page? Simply run it again with another web address (or file name) in the command line. it won't open another window, instead it will show the new website or file. What browser technology is InfoBrowser using? It uses the default IE component that comes with Windows, so it depends on the version of Internet Explorer installed on the PC. 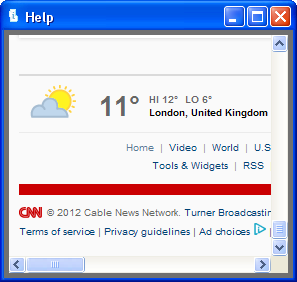 Can my software control the InfoBrowser window? Yes, you can download the InfoBrowser API SDK for that. Is it safe and free from Ads and Spyware? This product is %100 free from spyware and adware. It only communicates with the website YOU specify in the input parameter or file. Can you make it open source? The source code can be purchased, as we feel the "purchasable source" approach provides the best of all GPL/MIT and commercial licensing: You can get the source code and feel secure you have %100 control of the product you use, and on the other hand, the maker gets compensation for the hard work and time invested in the product. Free for commercial and non-commercial use. See License Agreement for further details (IBFLicense.txt). Download InfoBrowser FREE, which includes binary executable and documentation.